One-and-a-half-year-old Sumaya tries to feed on her mother's milk. Her mother Amandru gently pulls little Sumaya's mouth away from her breast again. Her breasts are empty. It has been more than seven days since she was able to last breastfeed Sumaya. With not much strength left to wait in the long queue, Amandru and her three children rest on the side of the tent where the meals are being served. Amandru and her children had to walk for almost four weeks to reach the refugee reception centre in Uganda. World Vision partnering with the World Food Programme serves hot meals to refugees who arrive at various border points into Uganda. World Vision staff offered to help get the meals for Amandru and her children. Amadru's body language changed as soon as a World Vision staff offered to help get the meals for her. The four of them sat down near the tent, little Sumaya on her mother's lap. The children were eager to start eating, but Amandru made sure the three children washed their hands before they touched the food. The four of them ate their meals. Their faces brightened. They were smiling. The first proper meal they have eaten in a long time. 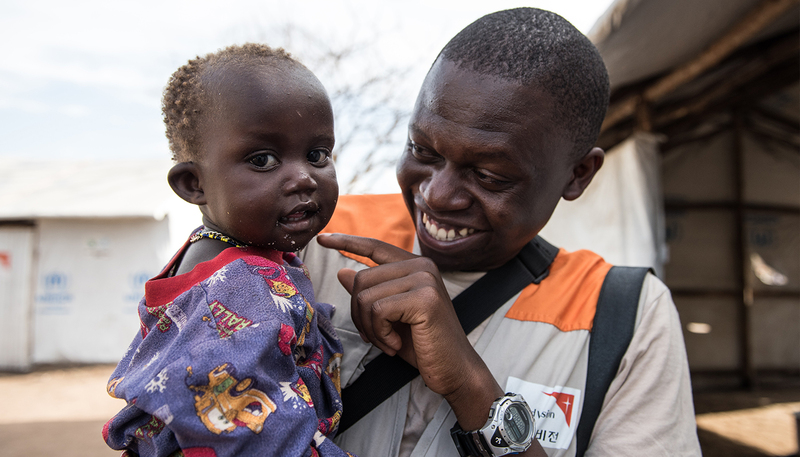 Once little Sumaya had her meal, she was visibly happier and more active, even playing with one of the World Vision staff.